The microbiome in our intestine plays a vital role in people's health and the immune system Any lack of balance there has not only been linked to chronic inflammatory intestinal inflammation, but also type 2 diabetes and other diseases. A group of researchers at the University Hospital Tübingen has now reported for the first time that they have discovered a mechanism on how the body's own endogenous antimicrobial defense shield regulates the microbiome and its bacterial composition; the article has been published in a recent edition of the Proceedings of the National Academy of Sciences. This mechanism provides a fundamental understanding of the structure of the intestinal barrier and host microbial interaction. "It throws open the door for future approaches to new treatments, but also for developing antibiotics and beneficial microbiome modulation," says the head of the working group, Professor Dr. med. Jan Wehkamp from University Hospital Tübingen. The researchers discovered a new "cluster bomb" like effect created by the body's own antibiotics, the so-called defensins (peptides), which are formed and secreted in the Paneth granule cells, in the small intestine. "The HD-5 defensin, which the body produces naturally and releases in the intestine, splinters into fragments if it is exposed to bacteria in the gastrointestinal wall in certain circumstances. These fragments do not, however, consist of ineffective waste, as was thought in the past, but they have an antimicrobial effect against commensal, harmless bacteria and bacteria that are pathogenic," says Prof. Wehkamp, describing the discovery. The researchers have found 250 new antibiotic combinations in all in the different fragments, when examining them in a laboratory. "This mechanism dramatically increases the antimicrobial spectrum against possible intruders," Wehkamp adds. The working group in Tübingen, which has been conducting research into the microbiome for many years, was already able to publish an article in in 2011 indicating that defensins play an important role in maintaining the balance between bacteria and the body surfaces in all organisms, particularly in the intestine (but not only there). The scientists use the latest publication in PNAS to demonstrate how the prevailing conditions inside our intestines affect the activity and structure of the peptides: In reduced conditions with only limited oxygen – a situation that often occurs in the intestine – the HD-5 peptide, which was originally secreted in a folded (oxidized) form, is opened and activated. It becomes more prone to degrading through its new linear structure: As a result, the proteases occurring in the intestinal mucus layer can break up the HD-5 defensin into many fragments – so activating this antimicrobial weapon. Out of one peptide the body creates endless combinations of attacking and controlling microboes which is a very smart and efficient way of defense. Interestingly, nature has created a completely different defense mechanism in the other Paneth cell defensin peptide – defensin HD-6: In contrast to HD-5 it is protected from any degradation by the proteases because it is able to form an impenetrable net. 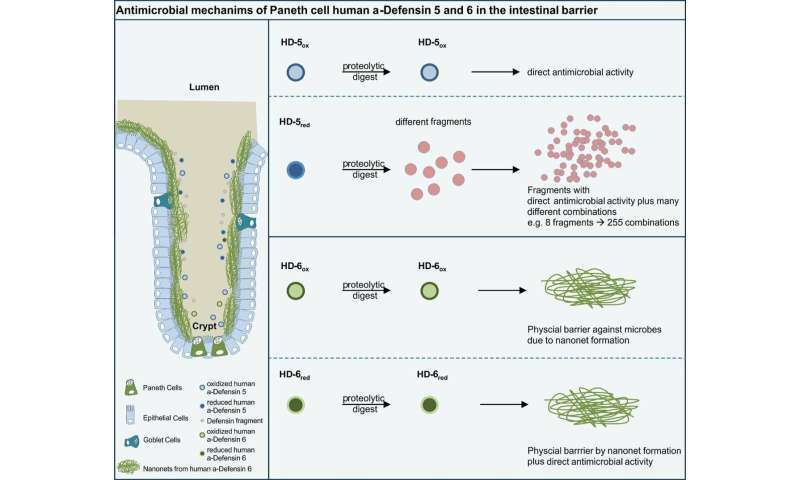 The scientists report that the HD-6 defensin remains completely stable in the natural gastrointestinal mucus, while HD-5 is broken down into fragments in the same location. The researchers were able to artificially produce individual fragments of the HD-5 defensin during a following stage and exposed them to different kinds of bacteria. The results were impressive: The fragments demonstrated amazing, variable, antimicrobial activity against harmless and pathogenic bacteria, including gram-negative bacteria, which are notorious for forming resistance to antibiotics. The working group in Tübingen was also able to prove that HD-5 fragments affect the composition of bacteria in the intestine of mice and increase the variety of flora in the small intestine. A particular HD-5 fragment was fed to mice orally, for instance – in contrast to a control group, which received normal food. The results were surprising: Administering the fragment led to a higher proportion of akkermansia sp. bacteria in the intestine of the mice. A decrease in the presence of these "good" bacteria had been associated with various diseases like diabetes mellitus and metabolic syndrome in earlier studies. "The fragmentation increases the variability of the antimicrobial defenses, particularly because the initial peptide is one of the most commonly produced and secreted peptides in the whole organism," says Jan Wehkamp. "This pioneering work has opened the door to an entirely new understanding of how host defense functions when confronted by bacteria, but also how the microbiome is regulated. This will be very interesting, as an enormous amount of research work is taking place on the microbiome around the globe," says Jan Wehkamp, summarizing developments. The discovery made by the group in Tübingen opens up opportunities of finding new antibiotic substances as modulators of the microbiome or new types of antibiotics. However, the ongoing analysis of fragments of antimicrobial peptides and their role in providing defenses against microorganisms – including possible approaches to treatment for bacteria that are resistant to antibiotics – is only at a very early stage. It is easy to reproduce the fragments discovered by the working group in Tübingen and they could play a role in treating various diseases in the future.